I really liked the fancy format we've been rocking this year... when it worked. The problem is it only worked about half the time, so I'm going for a simpler, easier to navigate site to help Esteemed Readers find their way to all the great writer, literary agent, and editor interview archives. There's a lot of great stuff in those archives and I don't want readers missing it because blogger can't keep their format consistent. Plus, I'm plotting some big changes around here in the coming months. I'm especially fond of the background, which was illustrated by my best friend and long-time collaborator, Adam Smith. I think I'll change that background occasionally to reflect the season. From now through Halloween, it's to be grim zombies. I hope you like them as much as I do. But Ninja, I hear you saying, "didn't you recently write a book about zombies? 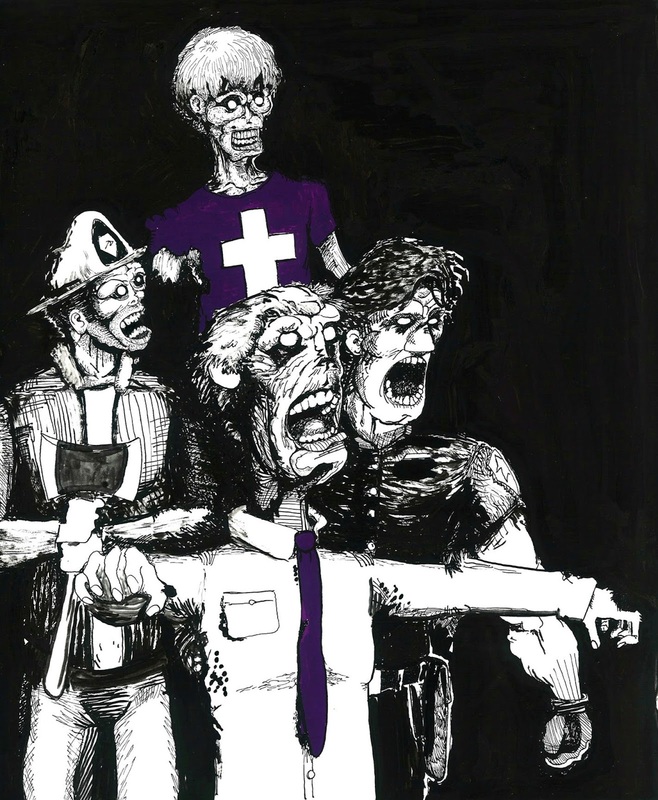 And now your illustrator friend is drawing zombies? What does it mean!?!" This rules!! I can't wait. If he gives you any soda to drink, run, Jody, run!